Diipa and Oleg were from different sides of the world. Yet somehow, Oleg, born in America, and Diipa, born in India, ended up meeting in the middle. It wasn’t until years after Oleg decided to call Europe his home and enrolled in university, that Diipa ended up crossing an ocean of her own, and (unbeknown to her) meeting him there. In a whirlwind of chance, Diipa, a new student to the university was welcomed by Oleg, the student body president. And just like that, this meeting was the first of many to come. Through the years, of university and beyond, Diipa and Oleg grew. Oleg became an esteemed Diplomat. And Diipa studied law, but naturally fell into the world of becoming a social influencer. Through all of these changes, the globe trotting couple made sure of one thing- that they grew together. It’s no surprise that the fashionable, beautiful and poised couple had a luxe series of events that were masterfully crafted. 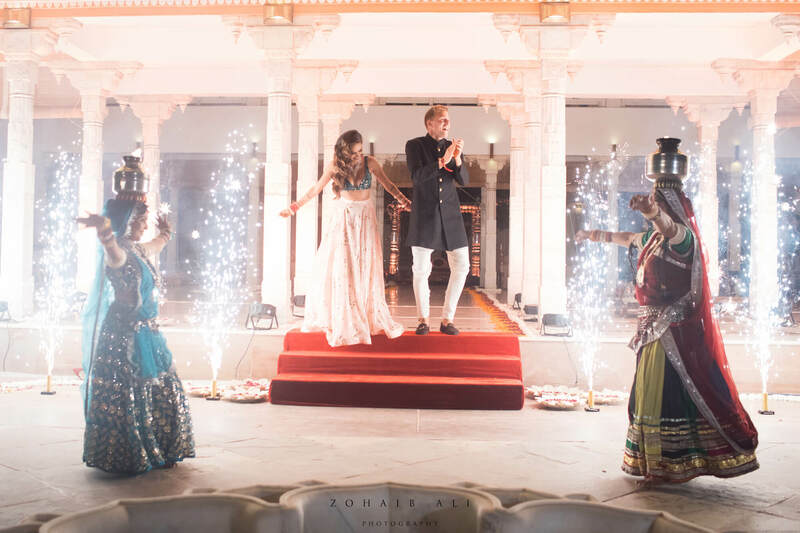 Diipa and Oleg chose the stunning, dream-like Udaipur to host their wedding alongside their 100 or so guests. To accomplish their destination wedding, they booked out the entire Hotel Fateh Garh hotel. The property, also known as ‘A Heritage Renaissance Resort’ proved to be the perfect backdrop for both sides to mingle, play and celebrate. The Mehndi, the Haldi, the Chooda. Both sides were able to witness the festivities and take part while the couple dazzled in the spotlight. 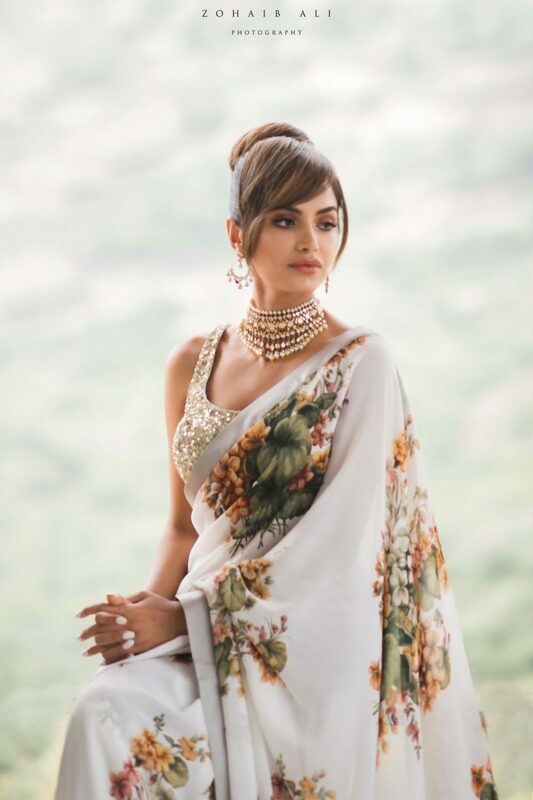 Opting for high fashion and a classic look to the Mehndi, Diipa wore an up-do to compliment her floral Sabyasachi saree, paired with a golden blouse. To match, Oleg chose an equally prestigious, Varun Bahl designer sherwani. The couple was a sight to see. Sticking with soft pastels, for her Sangeet outfit, Diipa wore her custom-made ensemble by Anamika Khanna. The evening was filled with laughter and love all around. But the best event of all, according to Diipa was the Haldi ceremony. To prepare for the haldi, Diipa dressed in a delicate light brown outfit by Ritu Kumar, while Oleg opted for a simple white kurtha pajama. And as expected, the decor gorgeously complimented the couple. Just a few hours later, the final pre-event, the Chooda ceremony took place. For that, Diipa wore a modern Mani K Jassal outfit, contrasted with a heavy choker. Dressed to the aces, and with little time before the wedding, Diipa was adorned with her bridal bangles. 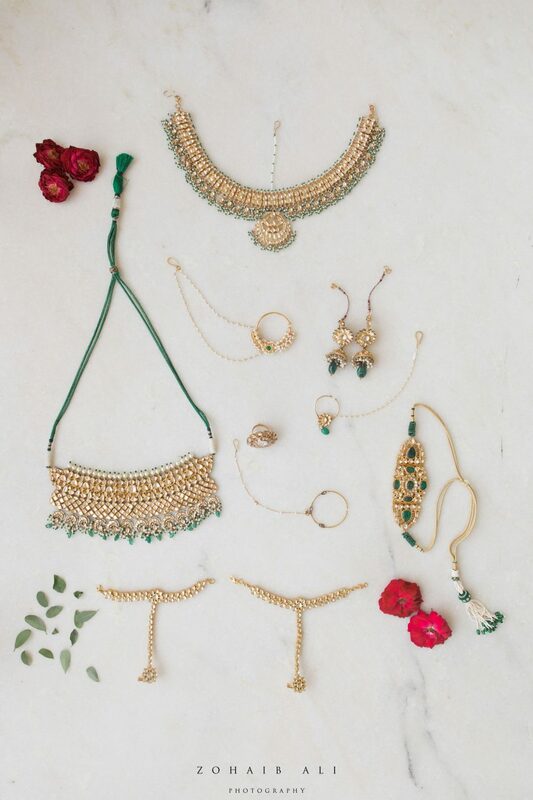 Throughout the picturesque wedding, guests not only had the Rajasthan experience, but they also experienced Diipa’s high-profile collaborations with the likes of Jimmy Choo, Sabyasachi Mukherjee, Sandeep Khosla and Laurent Perrier Champagne, and celebrity hairstylist, Aamir Naveed (from Aveda) just to name a few. So when the big day finally arrived, they weren’t surprised to see how exceptionally well the event and looks were coordinated. 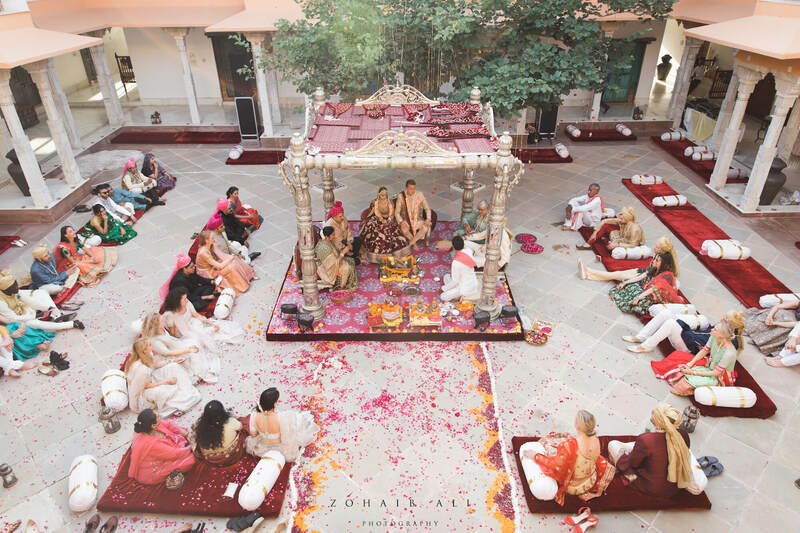 The Indian wedding ceremony came to an open after the stunning bride and groom arrived. 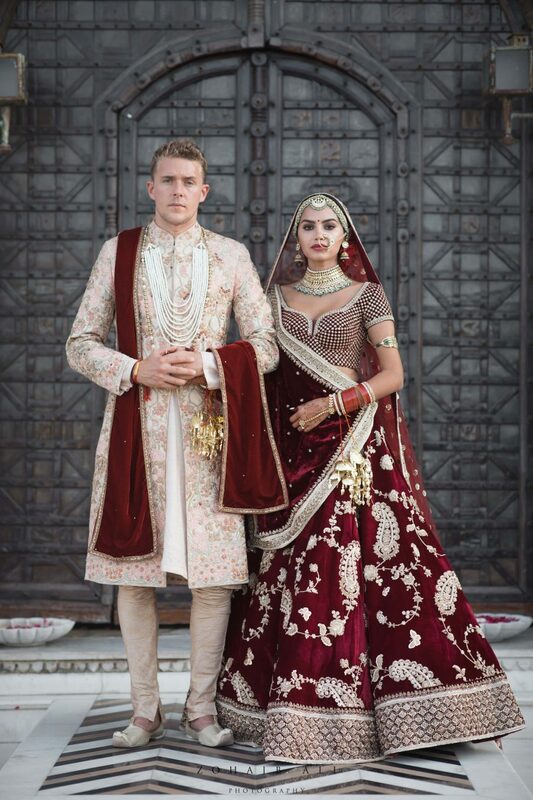 Diipa, dressed in a red Sabyasachi lehenga with traditional accents like a gorgeous matha patti and her newly worn choora, was complimented by Oleg in a cream, heavily embroidered sherwani. 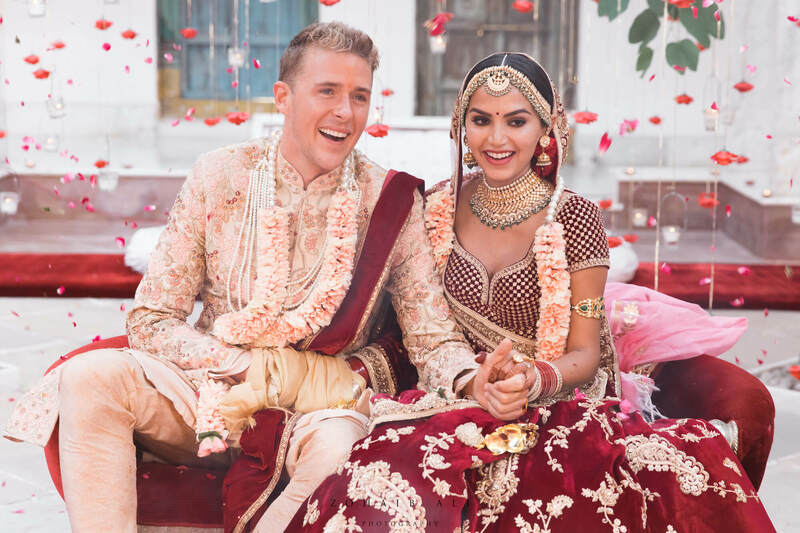 The couple celebrated both cultures by also having a white wedding. 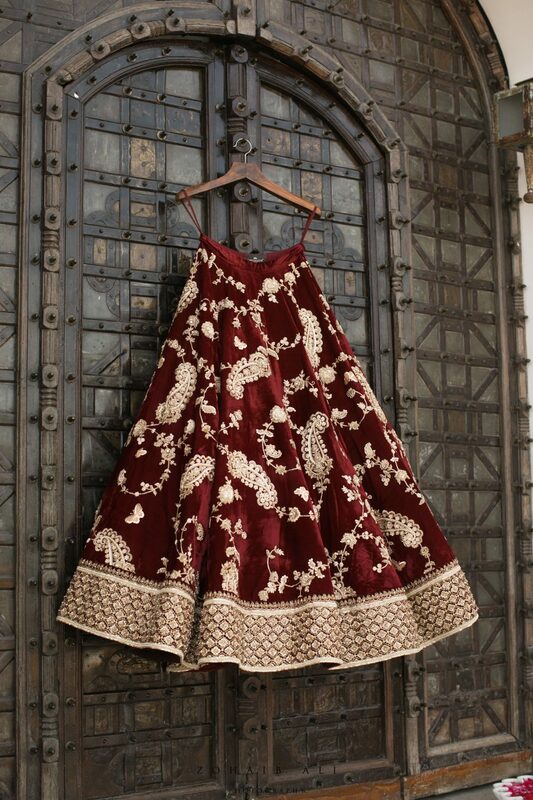 In this, Diipa wore a bespoke gown that took over 1600 hours to make- a masterpiece by Mohammad Ashi. 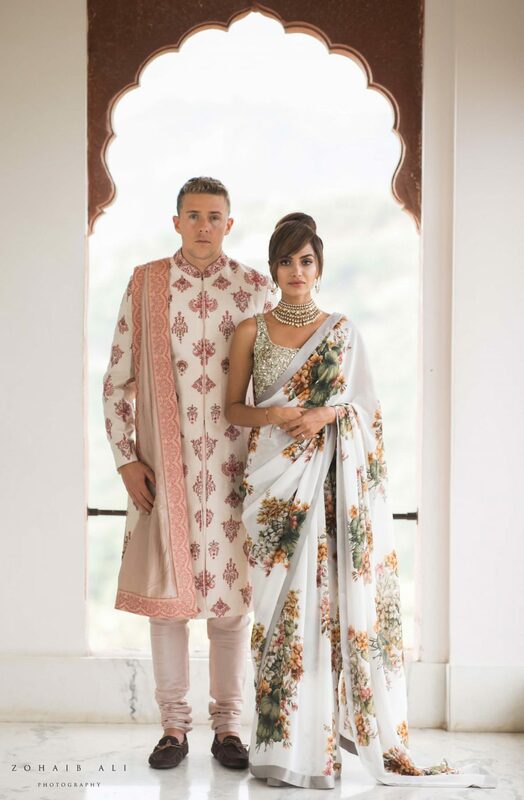 The contrasting looks made for incredible photos and a beautiful display of inter-faith and inter-culture marriage. The same evening, the guests and couple of honour arrived once again, but this time to close their wedding celebration with one final party- the reception. Diipa and Oleg wowed their guests with a slow dance, commemorating the memories they made in the days prior. 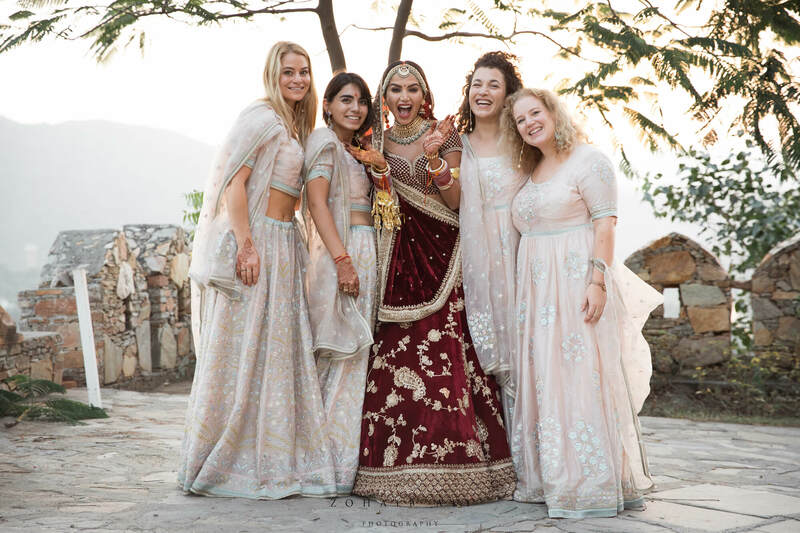 Through a few outfit changes, the newly wed bride changed between Pronovias, Manni K Jassal and Faraz Manan for the closing events. Meanwhile, her dashing husband, Oleg, wore a charming Sabyasachi sherwani. The garden-decor came alive in the moonlight of Udaipur and Diipa and Oleg danced and celebrated with their nearest and dearest. And that’s how the lives of two people, once continents apart, chose a life forever together under the romantic Rajasthan sky. 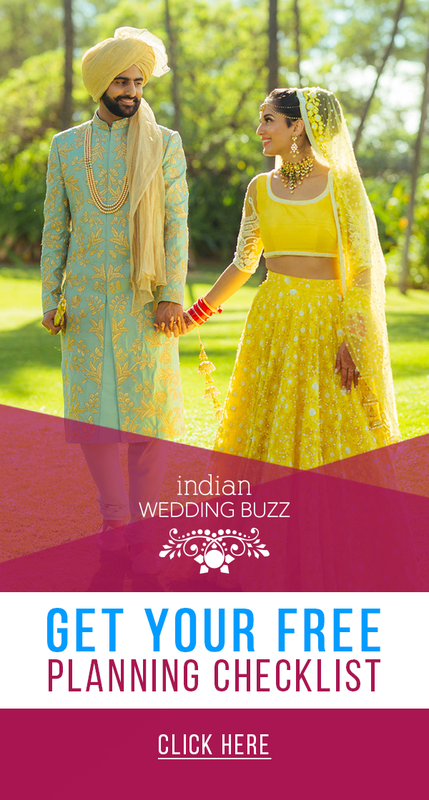 A free service where we help you discover and book vendors so you can plan your wedding stress free. Send us your wedding details to get started. Click here. Open to couples in US, Canada, UK, and UAE at this time.